ME 313 was a great class in creative design at Stanford. We had all sorts of interesting projects in this class, but my favorite was "Catch". The theme of the project was a person playing catch with a dog. Every project in this class had to be built using "primitive" materials, like wood, cardboard, paper clips, rubberbands, metal washers, and plastic. We could not use anything "complicated", like motors or electricity. We could only use potential energy from gravity or stretched rubberbands to power our devices, nothing else. For the Catch project everyone in the class was split up into teams of two. Each team had to build two machines. One machine had to act like a dog, the other had to act like the dog's master. From a starting line, the dog had to move at least six feet from the master, catch something that the master threw to it, and bring it back to the master. It had to be all automated. We were allowed to start the automation by cutting a string or dropping a weight or some other trigger method, but after that, we were not allowed to interfere with the machines. I decided to build the master machine and my teammate built the dog. My teammate came up with an extremely clever way to make the dog drive itself out exactly six feet, stop, then wait for my master to throw it a little plastic football. He put a large funnel on the dog. When my master threw the football into the funnel, the football tumbled to the bottom and setoff a mousetrap-type trigger to begin the dog's trip back to the master. My biggest challenges for building the master machine were to think of a good delay timer to wait until the dog could get into place before throwing the football and then to come up with a good reliable trigger method begin the throw. I had to make sure my throw was very consistent and reliably placed. For the thrower, I had the idea of using a 4-bar linkage. This kept the throw "hand" parallel to the floor. The 4-bar linkage hit a stop so it would throw the same distance every time. For the throw trigger I used a mousetrap lever, fishing line, and a big set of washers. 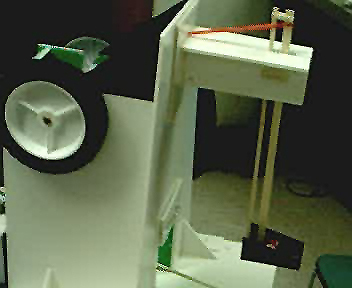 When the washers fell enough to pull the fishing line tight, it yanked the mousetrap lever activating the throw. I needed about a half a minute delay time, though, to make sure the dog was stopped and in place. For the timer I had the idea of using angular momentum. The professor said he had never seen anything like it before, so he drew up a picture of my angular momentum timer and gave it to everyone in the class. Out of about 30 teams in the class, our project was the only one that worked. It was a great day.